Great choice for faster growing hedges, with colour, good for screening. Supplied as a 40cm tall plant in 3L pot - plant any time of year. Plant 40cm (16') apart for hedging. One of the easiest of all evergreen shrubs to grow and keep so favoured by landscapers and parkkeepers , yet Aucubas or Japanese Laurels are far from boring. 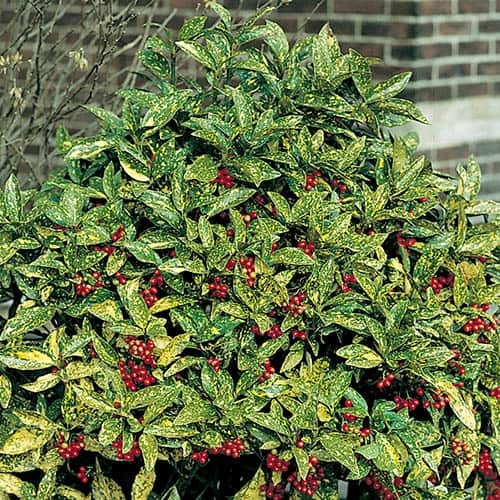 This one has striking shiny yellow spotted deep green leaves with a fine showing of bright red berries in Autumn. Used mainly as a dense hedge for eyar roudn evergreen interest (with it's classoic yellow spots), tt tolerates drought and most soil types and is . Seems to tolerate pollution well so very good in a town or city gardens. Easy to manage, not too vigorous, and is pretty tough and resilient. Plant 40cm (16') apart for a dense hedge in 5 years or so. Supplied as a 40cm tall plant in a 3L pot, ready to plant out all year.